TB often results in significant weight loss, which can exacerbate underlying undernutrition. Studies in India have shown that 50% of adult men and women with TB weigh below 42 kg and 38 kg respectively. Studies in rural India have also shown life-threatening levels of low BMI. Undernutrition in TB patients has been shown to be a consistent risk factor for death, and this is important in a country like India where current levels of TB mortality are high with 423,000 deaths due to TB. Undernourished patients are also at higher risk of serious side-effects of drugs, poor absorption of drugs, reduced ability to return to work, and recurrence of disease after cure. Undernutrition in TB patients is a medical condition like co-existing diabetes, or HIV infection. WHO recommends that nutritional assessment, counselling and support should be considered an integral part of TB care. The Indian National TB Program released a Guidance document on Nutritional Care and Support for patients with tuberculosis in India in 2017, one of the first countries to do so. This year has seen the launch of nutritional support initiatives in the form of food rations by many states. The Indian Government also announced a direct benefit transfer of Rs. 500 per month, to enable nutritional support for TB patients. All these initiatives will require healthcare providers to be skilled in nutritional assessment and counselling. 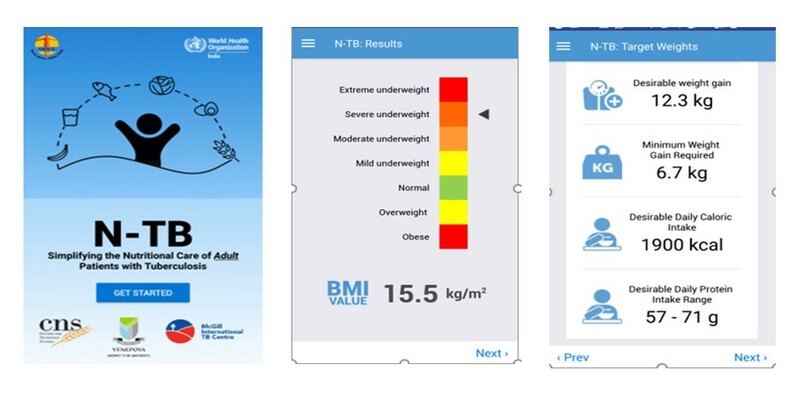 The N-TB is the first of its kind app for healthcare providers. It enables the classification of the nutritional status of the patient by calculating the body mass index (BMI). If the BMI is very low, it red-flags this and provides an overview of management of severe undernutrition. The app also provides the weight gain required during treatment to achieve a desirable weight, and the recommended daily caloric and protein intake (screen shots below). It has counselling tips on diet with an emphasis on the value of locally available foods in contrast to costly nutritional supplements, activity and lifestyle. The app, freely downloadable (at no cost) via Google Play, is endorsed by the Revised National Tuberculosis Control Programme and WHO India, was included in the new initiatives unveiled by Prime Minister Narendra Modi during the Delhi End TB Summit on March 13th 2018. As India gears up to implement an ambitious TB Free India campaign, it’s time to also focus on a measurable, preventable, and reversible coepidemic of undernutrition. Madhavi & Anurag Bhargava are professors at Yenepoya Medical College, Yenepoya University in Mangalore, India. They also co-lead the newly created Centre for Nutritional Studies at Yenepoya Medical College. Tripti Pande, currently a Project Manager at the McGill International TB Centre, obtained her BSc in Microbiology and Immunology at McGill University and completed her MScPH with a concentration in Global Health at Université Laval. 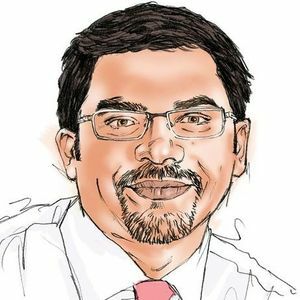 Madhukar Pai is the Director of McGill Global Health Programs, and Associate Director of the McGill International TB Centre. I am Bijay Maharjan from Nepal and work for TB patients in Nepal. We are carrying out nutritional supplement program to TB patients. I have used N TB app and its quiet helpful for the health worker. Can we start the N TB app in Nepal as a pilot study? It will be great that we can work together. Please contact Dr Anurag Bhargava in India. He created the App.